ALAMEDA, Calif. -- A dead whale found floating in the Oakland Estuary Wednesday has been towed away. The U.S. Coast Guard notified the National Marine Fisheries Service of a stranded whale floating in the estuary at about 4:30 a.m. Wednesday, according to the fisheries service. A John Beery Yachts employee found a 35 to 40 foot dead whale under a dock in Alameda Wednesday morning. Researchers are at the scene taking samples to find out why it died. The whale was found in the waters near Mariner Square Marina in Alameda, an employee at the marina said. A research biologist from the Marin Headlands-based Marine Mammal Center collected samples from the carcass, but because of the whale's positioning, the researcher could not definitively determine its species, which appears to be a larger baleen whale such as a blue or fin whale, center officials said. The Coast Guard collaborated with the National Oceanic and Atmospheric Administration and the U.S. Army Corps of Engineers to begin towing the whale around 5 a.m. Thursday, according to Coast Guard Petty Officer 2nd Class Barry Bena. The whale was towed to an undisclosed location, where scientists plan to perform a necropsy Friday to determine the cause of death, Marine Mammal Center officials. Officials say the whale was actually dragged into the Oakland Estuary on Monday by a ship belonging to Matson, Inc. 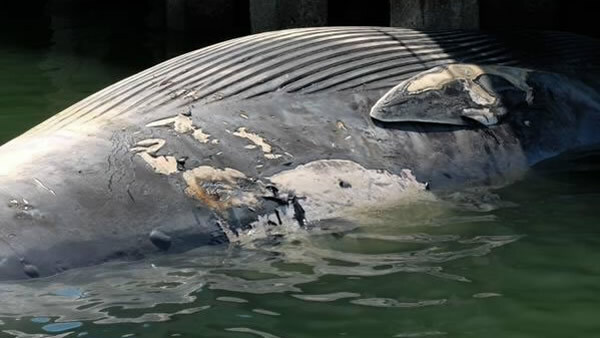 It's not clear if the whale was dead or alive when it was hit by the ship. 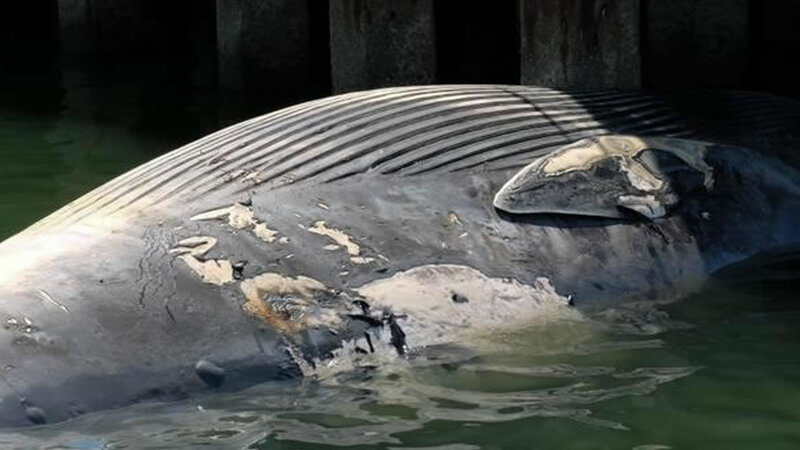 "Every whale stranding is an important opportunity to learn more about these creatures, and how we can prevent future deaths," Dr. Frances Gulland, senior scientist at the Marine Mammal Center, said in a statement. "With an increase in worldwide shipping, deaths from ship strikes will become more and more of a problem. Locally we must identify a solution that both works for shipping companies and keeps whales safe," Gulland said.